Meet Results Scores will be published to MeetScoresOnline and MyUSAGym throughout the meet. For static web page results click here. Last Updated: 03/16/16 09:48 PM Registration & full payment must be postmarked BY Friday, 3/4/16. 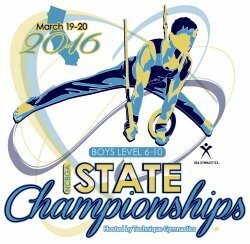 $25 late fee per gymnast for any entries postmarked after 3/4/16. Refund deadline is Friday, 3/4/16. once in a NorCal meet. on the floor with your kids. does not show it as current. Meet Shirts Shirts by Fine Designs will be available on-site. Price will be $10 if it is sent in with the State registration or $15 at the meet.